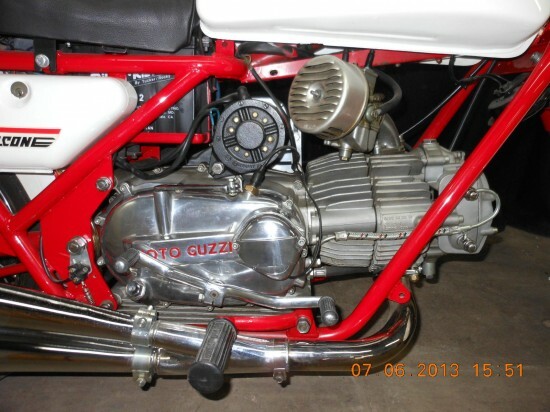 Unofficial Moto Guzzi week continues with this interesting example. Prior to the introduction of their v-twin, the Italian firm’s bread-and-butter was a line of big, lazy singles characterized by stump-pulling torque that made proper gear-selection an optional and generally unnecessary activity. However, the newly designed machine featured an entirely new engine that seemed to lack the original’s incredible durability and suffered from some development issues that plagued it throughout it’s lifespan. It also didn’t have that really cool exposed flywheel/shoe buffer feature. 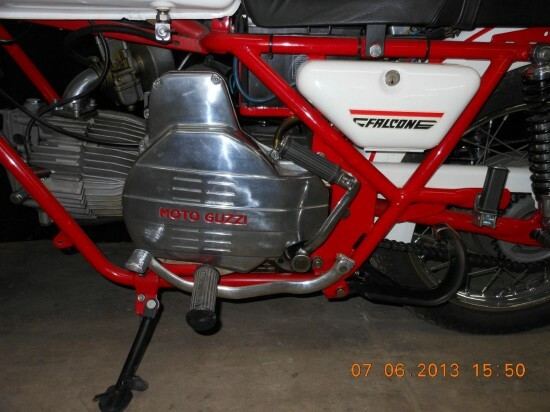 This is a nice example of a Nuovo Falcone. Was not sold in the U.S. but this motorcycle has been imported and has a valid US title. Been in a museum for close to ten years. Will need a battery. 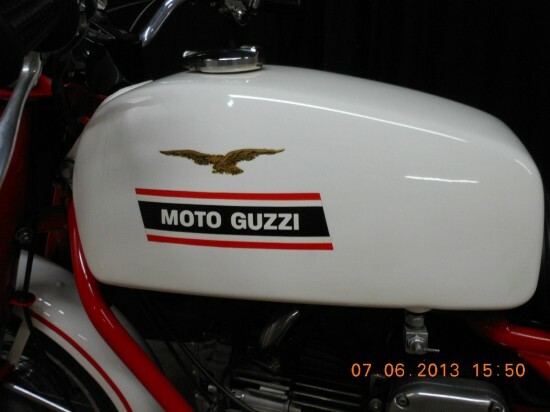 Absolutely a terrific Moto Guzzi. If you have any questions, please call Jim at 203-912-1104. The mileage is in KM. As with any machine with “notorious” reliability issues, many have been fixed over time: substandard parts are replaced or upgraded, or a specific example just happens to work as intended. I don’t know what it would take to make this example into a solid, useable example, especially since it’s been sitting on display for a decade. 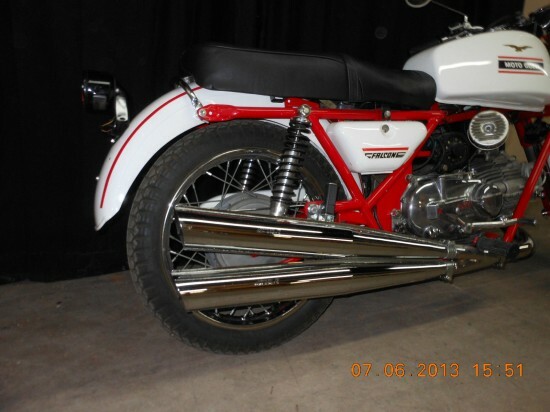 The original Falcone was an ideal rideable classic, but this one may work best in its current role as a display machine, unless a new owner is ready to do significant work to make it road-worthy. …”lacks the original’s incredible durability”….”a machine with motorious reliability issues”. The last paragraph is utterly laughable to me. Whoever Tad is, he’s full of complete utter “bolshevic”, most likely guilty of swallowing Mick Walker’s off-base damning writeup of the NuFalc from years back. Does he have personal experience? 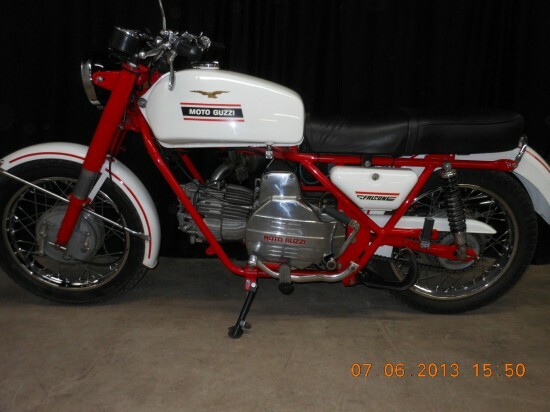 If this is original condition, it’s one of the cleanest NuFalc Civile’s I’ve seen. It’s been on display for 10 years! Horrors!! What could it possibly take to get it roadworthy?! Are you frikkin’ kiddin’ me? Not quite 39,000 kilos on the clock. 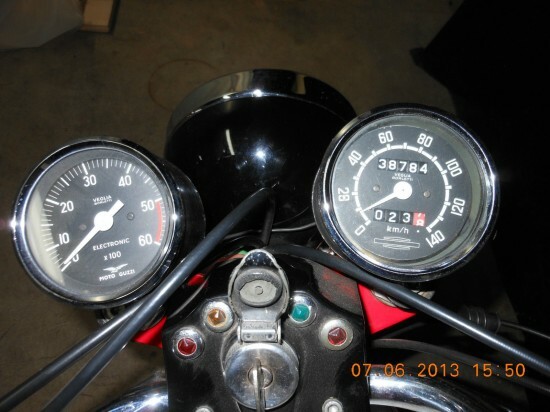 OK, my Nufalc had 70,000kilos put on it by the Carabinieri in the Old Country…rode hard ‘n put away wet. THEN it sat in a warehouse for some 18 years, with NO storage prep. Still had the Italian dirt and grease (lots) on it! Did it take some work? Yup… a fair bit, but I’ve yet had to do ANYTHING major to the engine. I’ve put 10,000 more kilos on it since puttin’ it back on the road. Yup, it sure is a piece o’ unreliable crap. Where’s this Tad? I’m gonna smack ‘im!! And what is it with people on this site wanting to hit me?! For a bunch of middle-aged gents who like to putter around on slow vintage bikes, you sure are a violent bunch!